Christian Shimer – Executive Producer and Editor of Ophelia Project films. 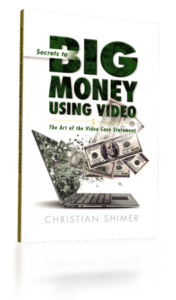 Christian Shimer developed the first ever method for creating “Video Case Statements” – videos with raising money in mind. His productions have provided many organizations with the visuals and approach necessary to capture attention (and hearts) of potential donors. Christian’s videos have launched capital campaigns through video that produce amazing results! Christian agreed to help Ophelia Project establish a visual marketing product. His vast knowledge and experience in all forms of production provided tremendous professional guidance to Ophelia Project both in the quality films he produced and in the guidance of how best to use those films for increasing public awareness, finding potential donors, and how to work with those interested parties. Christian’s approach to increasing visibility and notoriety, coupled with his technical abilities and his theatrical depth, certainly was the tipping point for Ophelia Project, and came at a time when our program was about to shut down due to lack of funding! John Shimer – Professional Fundraiser, Development Consultant and renowned Author of non-profit fundraising books, made a huge difference in the future of Ophelia Project. When he saw the tremendous potential of Ophelia Project programming and the number of young lives it touched, at a time when the economy was so challenging the program may shut down, John suggested an action plan for the Board of Directors to follow that literally changed everything! That development plan included producing a video that would help show the world what Ophelia Project was all about. John recommended his son (a professional producer) Christian Shimer. With underwriting for the initial film production, Ophelia’s first film was made and once it was seen in a large convention hall of potential donors, Ophelia became an overnight success! Ophelia Project owes so much to John and Christian Shimer! The Shimer Gentlemen have our eternal gratitude! The goal of this book is to provide non-profit organizations of ANY size or financial capability, the understanding they need to be able to guide the development and use of their own fundraising video.